Hi all! Over the last few days I’ve seen numerous rumblings online regarding the recent announcement of the Wii U’s release date and prices for the system. “Too expensive” they cry! “Not enough memory” they wail! 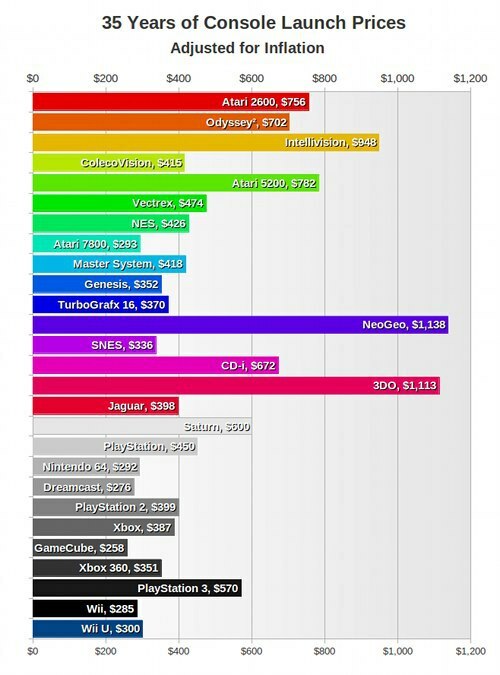 It’s somewhat relevant that I’ll start today with this graph comparing the relative prices of console releases over the years…with the twist of adjusting their costs relative to today (adjusted for inflation). I’m not at all surprised that the 3DO is one of the most expensive as it was released for upwards of $700US in its native country. Though I’m not all regretting that I didn’t grab one on import for $1300 in 1993, I wish I’d picked up one (or more!) for less than $10 a pop when I was in Japan in 2005. I do, however, shudder to think about how much I paid for my first imported Atari Jaguar! Sega have just announced the release dates for the HD remakes of NiGHTS Into Dreams (along with the December 1996 expansion Christmas Nights) and Sonic Adventure 2. The release date for the two games is October 2 for both PSN and Xbox LIVE Arcade. 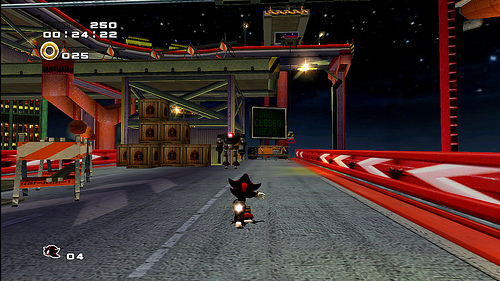 Both have been given the widescreen and HD treatment, with NiGHTS also getting updated visuals. A teaser trailer for ‘The King of Arcades’, a forthcoming documentary, has emerged on YouTube. Enjoy this brief look – I don’t think much else needs to be said, other than bring on the full release! What do Kuribo’s Shoe (Super Mario 3, NES), the speed bike from Battletoads (NES), and Starfox’s Arwing (SNES) have in common? They’ve made the grade in 1 More Castle’s Top 10 Vehicles In Retro Video Games. This list brings back memories, though the reality of arcade Spy Hunter is less kind than my memory had indicated…it’s damn near impossible! 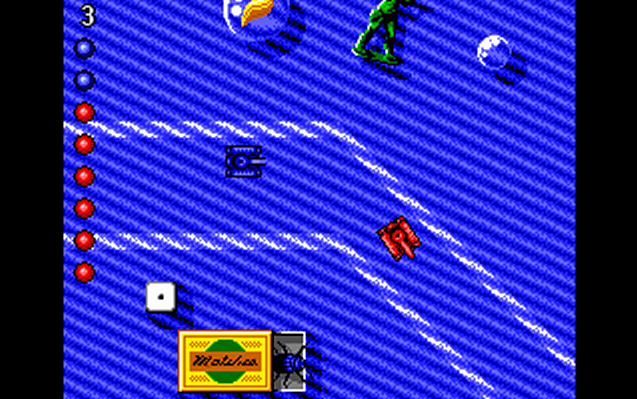 I recommend the C64 version of Spy Hunter if you want to last more than a minute. Check out their list here. 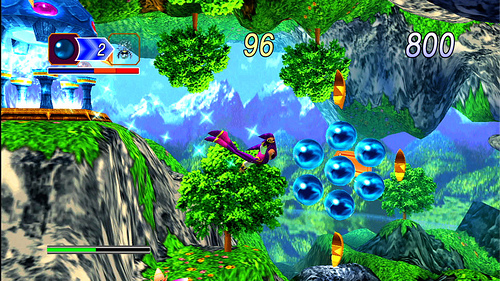 The original Rayman was released in the mid-nineties on the PlayStation, Saturn and Jaguar. It was (and still is) a gorgeous, clever and whimsical side-scroller. Last year’s release of Rayman Origins that harkened back to the original 2D style (compared with the Mario 64-like 3D of its sequels) was by all accounts a welcome return to form for the series, though unfortunately I haven’t gotten around to playing it yet. A new Rayman ‘endless runner’ that isn’t quite so endless (it has levels) entitled ‘Rayman Jungle Run’ has just been released on iOS. Though it obviously doesn’t have the same depth as Rayman Origins (and the forthcoming sequel Rayman Legends) it uses the same engine and heavily references the original gams. Initial reports so far seem positive. Rayman Jungle Run is available now on the app store for $2.99. On the topic of iOS, Street Fighter X Tekken, another game with roots in the classics, was also released yesterday. I’ve played both Street Fighter IV and Mortal Kombat on iOS, and although I can say that touch controls are definitely becoming better as developers have gotten to grips with the pros and cons of this type of interface, I’m definitely hoping for eventual iCade support on this one. Here’s a 7+ minute demo as shown at PAX only a few weeks ago, where the producer discusses, amongst other things, how they’ve aimed it at a more ‘casual’ audience for touch screen gamers. Street Fighter X Tekken is available now on the app store for $2.99. It’s a shame that next month’s Tokyo Blip Festival signals the final instalment of this chiptune event / party / festival (for the foreseeable future). The chiptune ‘genre’ is still evolving in numerous exciting directions beyond it’s roots, as is typical with many evolving styles of electronic music. With that in mind, I recently watched the documentary ‘Reformat the Planet’ (2008) about the origins and artists behind Blip Fest. Though it focuses on the personalities and musicians involved in the event, and only briefly touches on the consoles behind the music (mostly the Gameboy and the NES), it’s a fascinating look at the repurposing of technology to create something new, never mind something vastly different that the old consoles’ original raison d’etre. 2PlayerProductions has uploaded the entire documentary onto YouTube, with the first instalment embedded above. You can find out more information and buy the double DVD set from the 2PlayerProductions website.